august 27, 2005: why, yes, that is US on the cake, thanks for noticing. happy wedding skinny people! 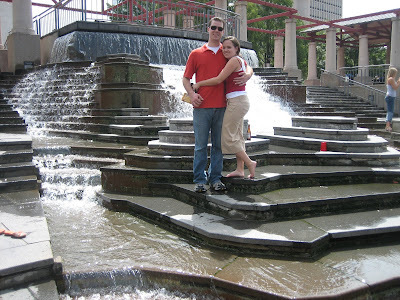 august 2006: anniversary 1: in St. Louis before a Cards game. august 2008: anniversary 3. the year we apparently did not celebrate an anniversary or commemorate the moment with a photo. huh, something must have been distracting that year. august 2009: year FOUR. well, HELL, someone better remind me to take pictures of me and my husband on OUR anniversary. maybe even without a baby in them! because in the month of august thus far i have shot a few hundred photos and very few even have us in them. huh. the opportunity to look like HORRIBLE parents! i am worried to take him out in public - i don't want anyone to call child protective services on me. i mean, kids fall down, right? UGH. say a prayer that it magically goes away overnight. Happy Anniversary, and kids fall. Happy Anniversary! Hope you enjoy your trip and MAN NATE'S FACE LOOKS AWFUL. Poor guy. I think he got Nash's face beat. Nash's bruise healed up quick so maybe his will too. Got my fingers crossed. yay your wedding picture! That cake is too cute :) And I like the 2nd anniv. pic of you guys, really goo dof you both! 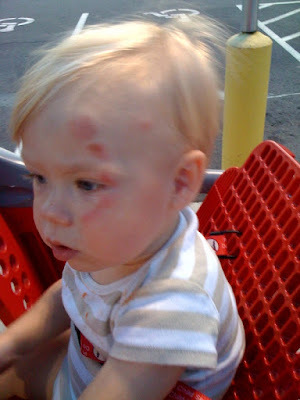 Poor little Nater pants, that looks like it really hurt :( I'm sure that is just one of many, many cuts and scrapes to come. Happy Anniversary! Hope you have a great one! Awww yay!!! Happy Anni!!!!! :) YAY!! Have so much fun in NYC!!! The injuries make him look tough. Chicks dig scars. And I may have been guilty for putting make-up on Elizabeth many, many times to hide all her scrapes and bruises those first two years. If nobody calls SCAN on me when I whip out the wooden "sad spoon" ofrom my purse in the middle of Target and go to spankin', nobody will get onto you for Nate having a boo-boo or 2...or 57! Happy Anni! Feels like Mary and I were just there partying with ya'll!